Bartek Ciszewski: What is the idea behind Barometa? Rupert Sellers: It came from my personal experience. I started my career in the luxury hotel industry and then about 15 years ago I specialized in recruitment for this sector. Working closely with clients and candidates it became clear that there could be a much better solution than the existing recruitment methods - ie job boards, LinkedIn and agencies. All of these channels have flaws. Job boards and aggregator sites may appear cheap, but their focus is on quantity, not quality. It's very easy to distribute a job advertisement, but typically 90 percent of applicant CVs that land in a recruiter’s mailbox are unsuitable. Processing talent this way is a waste of time and is not cost-effective. Furthermore, companies have to be ruthless in eliminating candidates which can result in hidden gems being missed. But perhaps the biggest problem with job boards is that the best candidates don't apply for advertised jobs. This passive talent is usually the most sought after - They are open to new job opportunities but need to be approached. Bartek: How about LinkedIn? Isn't it more efficient than job boards? Rupert: LinkedIn provides a platform for active and passive candidates, in that their LinkedIn profile (like a CV) is in the public domain for recruiters to view. The problem with LinkedIn is that recruiters struggle to ring-fence relevant talent. Keyword searches generate poor matches, often because users (candidates) exaggerate and add keywords that do not apply to their skills and experience. Active job seekers, who might lack job stability, tend to spend much more time on optimizing their CV and LinkedIn profile, compared to people who are not actively looking. These passive candidates are more likely to be high achievers, focused on their work – and in many cases haven’t added searchable keywords in their profile. Bartek: What are the challenges working with a traditional recruitment company? Rupert: Firstly, employers need to identify a bona fide agency – there are a few good ones, and there are many bad ones that don’t understand the requirements of clients or candidates. Using a good agency is convenient for recruiters to outsource the process, but this method is very expensive. Should companies have to spend thousands of pounds on a candidate placement, when they could easily find that candidate themselves through a more cost effective channel? Increasingly, many hotel companies refrain from using agencies and instead use their in-house team to source and hire talent. Bartek: How does Barometa solve these problems? 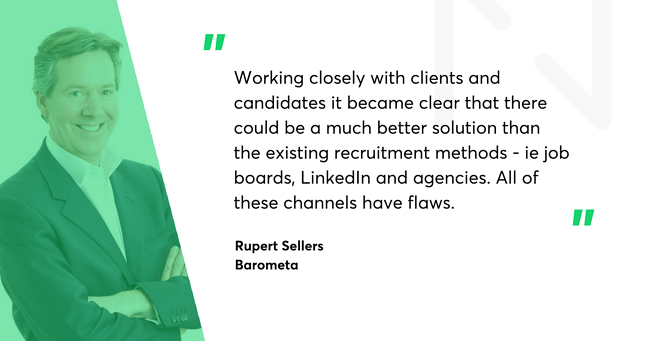 Rupert: Candidates sign-up to Barometa, but unlike LinkedIn our platform has only curated listings and is not in the public domain. It’s the perfect portal for passive candidates, where they can be approached by relevant employers and not be solicited by random recruiters with unsuitable jobs. Every candidate records a video and is pre-screened and categorized by Barometa to ensure accurate matching. The video profile is kept very simple and is tailored to the hospitality sector. Profiles can only be accessed and viewed by signed-up employers that are suited to the candidate’s experience and career plan. Apart from Barometa, I also run an online video interviewing service. It’s clear to see how video enriches the selection process for employers, and usage of this tool is becoming more and more widespread. But it’s not a great experience for candidates if they have to record a new video each time they apply for a job. Bartek: How does Barometa match companies with candidates? Rupert: We provide a curated service. In this sense, it works a bit like a recruitment agency. The Barometa team assess and categorise every candidate by hotel type and job type to ensure the best matches for our range of clients. For example, luxury hotel brand Four Seasons will have different requirements to mid-tier brand Hilton or budget brand Travelodge. Best-fit candidates are presented via the dashboard, once the client has selected job category, salary range etc. Job boards and social networks are not able to perform nearly as effectively. Ranking of talent is constantly updated on the system from aggregate ratings and comments on candidates generated by the client users. We are able to standardize and optimize the recruitment process for hospitality, making it fast, accurate and cost effective. Rupert: I happened to get an email from Wiktor [Netguru co-founder] just at the right time. He was doing rounds in London, and I was looking for a development team I could partner with. I looked at Netguru's portfolio, and decided to give it a try. From my previous startup experience, I knew that I needed to build a prototype first, even before building an MVP. I'm a perfectionist and I knew that I could easily get stuck in improving details. It was important this time to prioritize and focus on user journeys and develop essential functionality. There are many ‘nice-to-have’ features I am planning, but these can be designed later. Bartek: What was it like working with Netguru? Rupert: It was great to find out during the scoping session that the Netguru team and I are on the same page. We came up with a plan to build a prototype in just a few weeks. This efficiency makes it possible for me to tweak the model once we get feedback from the first users. I’m very happy with the service. I visited the office in Poznan and met Svetlana [the project PM] and the developers. They were very welcoming and I have been impressed since the scoping session. Svetlana understands the brief well and what I want to achieve, and she is able to communicate it to anyone that joins the project. Additionally, the Netguru team are my product's demographics, that's why their opinion is important to me. I made it clear when we did our introductions that I wanted them to be very honest about the project to ensure the best UX possible. They were very helpful and we had an open conversation about the planned solutions and how things should be organized. It took us a while to get the right graphic design, but it was worth it. It's fresh, clean and different from competitor platforms. I like the UX a lot. When you do your search in LinkedIn, the results don't give much away. You have to click on each profile to learn more. With Barometa we show much more relevant information in the thumbnails of each candidate. This saves time and is more convenient for employers. Bartek: Did you have any problems working remotely? Rupert: Not at all. I found each Netguru team member I worked with highly intelligent and they are also experts in using remote collaboration tools. These days working remotely is so easy to do. Having calls, Slack interactions, and prototyping using InVision made everything very smooth. However, meeting in person and getting to know each other was very beneficial. Bartek: How is Barometa doing now? Rupert: Investor meetings are under way but the main challenge is finding the right investor. I hope to find an individual or firm that has a feel for either hospitality or recruitment, or both. The Barometa model can scale easily and I am confident the business will generate significant revenues and profits, but I am also really excited that Barometa will provide a great recruitment solution. I know from the feedback I receive that hotel employers and candidates are crying out for something like this. There is a lot of new tech around in recruitment, particularly ‘Tinder’ style apps for shift work, but no-one has yet delivered a sustainable solution that matches career-oriented people to the more permanent type jobs in hospitality. I believe candidates in the recruitment process need to be treated better. Their job application shouldn't go into thin air, as is so often the case. Through Barometa, communication will be much tighter and, post MVP, I want Barometa to start recognizing candidates’ habits and employers’ needs so that the system constantly improves. The prototype was built in just a few weeks and it has already proved to be helpful. There is still a long way to go, but finding the right tech partner I can work with in the long term is a great asset. The next step is to build the MVP and start driving revenue.